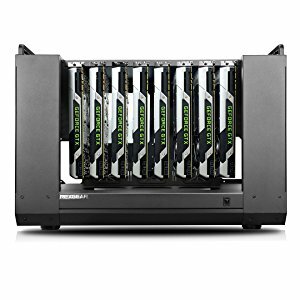 The Hydra 1 is a custom made mid-tower case for high density GPU mining using 8 cards. This case supports eight full-length graphics cards, one ATX/Micro-ATX motherboard, and two power supplies for better power distribution. If you want to use this case as a bench or test bed, it is great for that too with an open-air chassis design that lets you get in and swap cards easily. There are two aluminum handles on top so you can just grab and go. Thick industrial quality steel offers outstanding strength and durability to hold all your cards without flexing for safer storage and transport. The motherboard is mounted behind the case with 85 mm of clearance for CPU coolers. Extended distance from MoBo to GPU allows optimal placement of your cards. 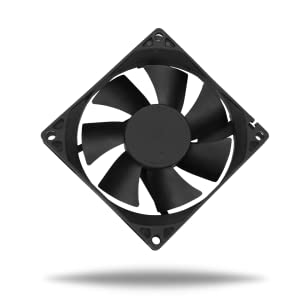 You can install 3 x 120mm high RPM fans that blow hot air out of the case from bottom to top. This case is a great compromise between the heavy-duty server cabinet solutions and light-duty open frames. It provides high structural rigidity and quick access to components. 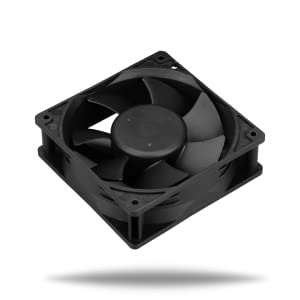 The Hydra 1 has been designed with maximum GPU performance while maintaining a modest size. 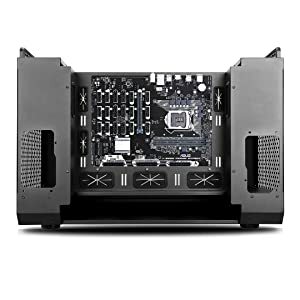 By strategically placing the motherboard behind the chassis, it allows you to vertically mount 8 dual-slot reference cards in a standalone configuration. 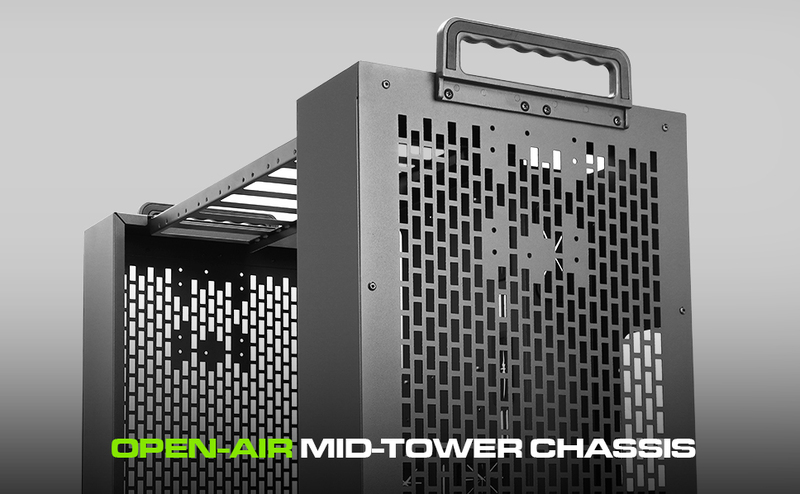 You can install up to 3 x 120 mm high RPM server fans at the bottom of the chassis. 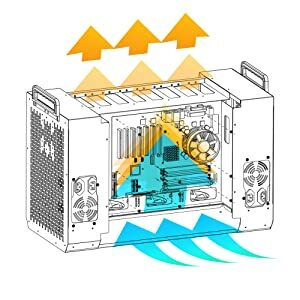 Those fans draw in cold air from the bottom (back) of the chassis. And blow the hot air out at the top of the chassis. Do you Prioritize Power And Portability? Reference cards have standard PCB/cooler up to 300 mm in length115 mm in height. These cards are your best choice for power and portability as they occupy less space compared to aftermarket ones. 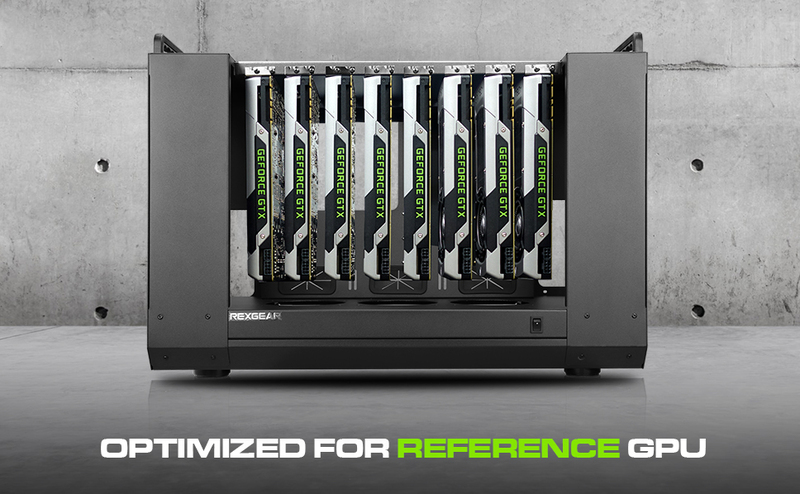 The Hydra 1 is optimized for dual-slot reference GPU and will fit 8 of them in flush position. 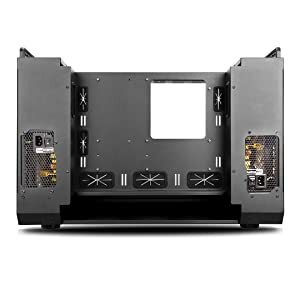 3-in-1 chassis design for GPU number crunching, bold looking PC gaming, and quick access test bed. It is all up to your interpretation! Extended distance from motherboard to cards for easy installation, and up to 85 mm of clearance for CPU coolers (in flush position). Use two power supplies for improved power distribution and efficiency when just one is not enough for your cards.